We love a good weekend adventure! Our latest was at Buena Park, California sponsored by Visit Buena Park. Buena Park is about 2 hours north of San Diego and makes for an awesome weekend destination for families. Everything in Buena Park is super close and you can just walk to most attractions in the area. We checked into our hotel and were able to walk to breakfast, an awesome pirate adventure dinner and even Knotts Berry Farm! We arrived on Friday afternoon and checked into the Radisson Suites Hotel at 3PM. We unpacked our things and headed straight to the pool to cool off. Visit Buena Park left us some super cute snoopy toys and ears. They also left a voice recorder box that played Vacation by the Go-Go’s. Probably the cutest and smartest marketing move I’ve seen in a while. I think they should leave these in all hotel rooms to get people excited about their vacation. Then the little sir got too excited and fell over while dancing. Even funnier. He was totally fine. Our hotel was very convenient to the attractions we visited. It also had two rooms which made it awesome for traveling with kids. After the pool we headed for a short walk to the Pirate’s Dinner Adventure. We passed right by Medieval Times on our way and the little missy requested a photo by the castle. The cutest. I wasn’t too sure what to expect from the Pirate’s Dinner Adventure but it was so much fun for all of us! Upon arrival, we were greeted with pirate headbands and given a color to remember for our seats. There’s two bars and a gift shop in the waiting area. Appetizers like fried mac n’ cheese and carrot sticks are given out while everyone arrives and awaits the big show. The show starts off in the bar with pirates flying through the room and landing on the bar stage. After the pre-show they take guests by color to the main show which takes place on a replica 18th century Spanish ship on top of a 250,000 gallon indoor lagoon. During all the pirate action, we were served a three-course meal including a salad, chicken & shrimp dinner with a cake dessert. The show ended up being very interactive for our family. Each section is divided by a color and a pirate to root for. We were the red team and our pirate must have liked our family. He asked Mark to help pull the flag up and even gave the kids pirate treasure for helping out. Then Mark ended up on stage to help out with part of the show. It was so exciting! The kids absolutely loved it. I would go again anytime. It really was a fun night out for all of us with so much excitement. The next morning we headed to Porto’s Bakery for breakfast. I’ve heard nothing but good things and had to check it out. It was absolutely delicious and I wish we had one in San Diego. They had so many tasty savory and sweet options. We had a little bit of everything. I loved the chorizo meat pies and the delicious fruit Torrejas. After breakfast we went to the hotel for a quick break then walked over to Knotts Berry Farm. It was so nice getting there right when they opened at 10. There were hardly any lines in Camp Snoopy so we went there first. We rode a bunch of rides together then we took turns with each kid. Next, Mark and the little missy were ready for some big rides. They headed off to the roller coasters and Bigfoot rapids. The little guy and I walked around Ghost Town for a while and checked out all the shops and western town. He loved seeing the horses and check out the old town water spout. 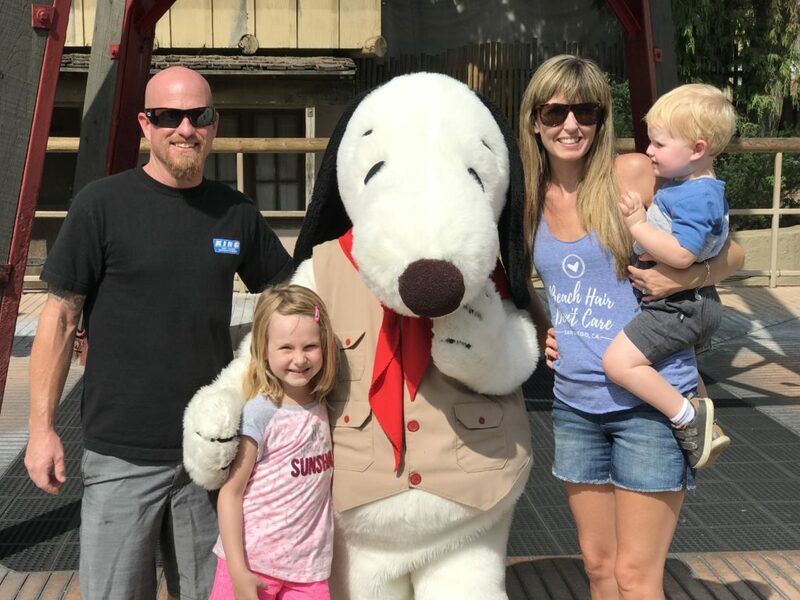 We had the all day dining option for Knotts which made it really easy to stop and grab a bite to eat at their participating locations. We had some tacos, nachos and had our fill. We had to try that Boysenberry funnel cake (not on the dining plan) but so worth trying. It was huge and the four of us could barely finish it. Yum! We loved our adventure at Buena Park with the kiddos. It was an awesome last weekend of summer trip and we plan to do it again every year. Have you been to Buena Park? What was your favorite attraction?